The first violin part for Haydn's Symphony No. 88 in G major, H. 1/88 has been edited by Richard Roberts, concertmaster of the Montreal Symphony Orchestra. Roberts' bowings, fingerings and other editorial markings have been added throughout the score. Haydn's Symphony No. 88 is a four-movement work. Beginning with a brief introduction, it moves quickly into the main body of the first movement with a statement of the main theme in the strings. Almost every statement from this point forward derives from a previous idea. The slow second movement moves to the dominant D major and marks Haydn's first use of trumpets and timpani in his slow movements. The minuet & trio returns to G major with a rather simple theme. The symphony concludes with a sonata-rondo finale that ends with an unusual cadence on the mediant: a "perpetual-motion finale" that is considered one of the most cheerful ever written by Haydn. Download and print the score today to gain access to expertly edited Haydn Symphony No. 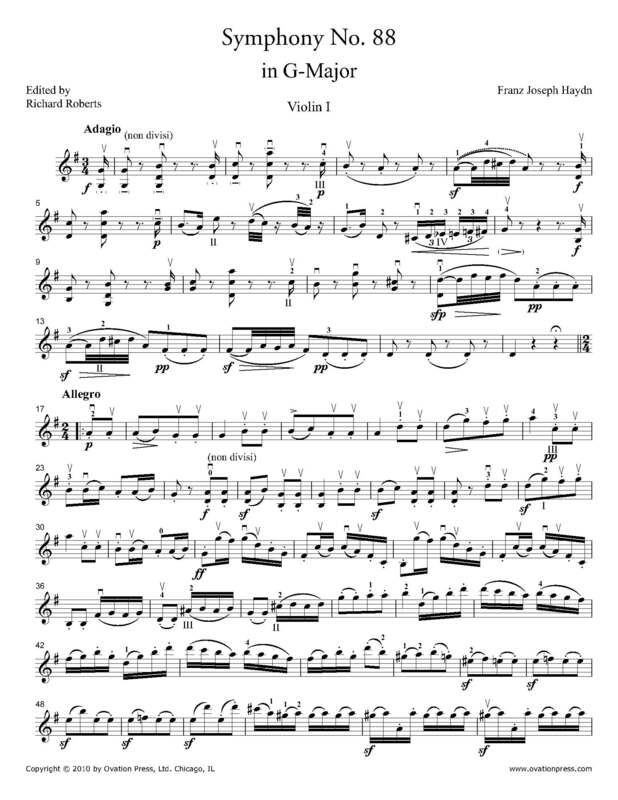 88 violin fingerings and bowings from Richard Roberts!